Perched at a height of 3,600 meters, Chaainsheel Bugyal is a hidden destination in Uttarakhand that has eluded trekkers for a longtime. Lying on the border of Uttarakhand and Himachal Pradesh, the lush green meadows at Chaisheel valley in the Uttarkashi district offers uninterrupted views of the majestic Himalayan peaks of Bandarpoonch, Kalanag and Swargarohini to name a few. It is one of the least explored trekking destinations in the state and therefore perfect place for adventure seekers. Uttarakhand Tourism declared Chaisheel valley as the ‘Trek of the Year 2017’ and will organize few treks in May-June this year. The verdant Chaisheel consists of half a dozen meadows spanning several kilometers in all directions and is home to few high altitude lakes as well. The trek route to Chaaisheel will offers scenic views of the floral landscape along with river streams and cascading waterfalls. The place is also ideal to host winter games. Day 1: Dehra Dun to Balawat (1915 mts). Drive from Dehradun to Balawat, it takes around 10 hours to reach Balawat. Day 2: Balawat to Sunaooti Thach (3170 mts). It takes 5-6 hours for 8 kms of trek. Day 3: Sunaooti Thach to Samta Thach (3550 mts). It takes 7-8 hours for 14 kms of trek. Day 4: Rest and exploration day the area. Day 5: Samta Thach to Tikula Thach (3110 mts) via Sarutal. It takes 5-6 hours for 8 kms trek. Day 6: Tikula Thach to Dagaan Moriyaach (2870). Another 4-5 hours of trek. Day 7: Dagaan Moriyaach to Chinwa; 3-4 hours of trek. Departure for Dehradun, you might reach Dehradun by 10 pm. Thought this trek is easy to moderate but lenghty trek. So do start your physical exercise like running and swift walk for this trek. Sunoiti Bugyal:The lush green Sunaiti meadow covers than a kilometer in area and is surrounded with oak trees. Trekkers can also visit the river stream few meters below the meadow. It is an ideal camping spot for trekkers and can also be turned into a winter sport destination when it snows. For reference, the area at Sunaiti meadow is larger than that at Auli. Saamta Bugyal: Another lush green meadow in Chaisheel valley which is laden with myriad flowers and shrubs. The whole meadow is around 3 km in area and offers spectacular Himalayan view. The place is ideal for creating world class skiing and snowboarding tracks. Sarutaal: Situated across the border in Himachal Pradesh, Sarutaal is a high altitude lake which is known for its pristine beauty. The reflection of the snowy Himalayan peaks in the lake is something that stats with the visitors for lifetime. Devban: Devban is a pilgrimage destination situated in the Chaaisheel valley. This pilgrimage is dedicated to Lord Pavaasi, who is the local deity of the Bangaan region of Uttarkashi and is believed to be the reincarnation of Lord Shiva. This temple is situated amidst the verdant deodar trees and makes for a spectacular sight. Murlachaad Watefall: This waterfall is situated 1 km from Kelaidhaar and is believed to be three times greater than the Tiger Fall and Kempty Fall. The nearby scenic surroundings are added bus when visiting the waterfall. 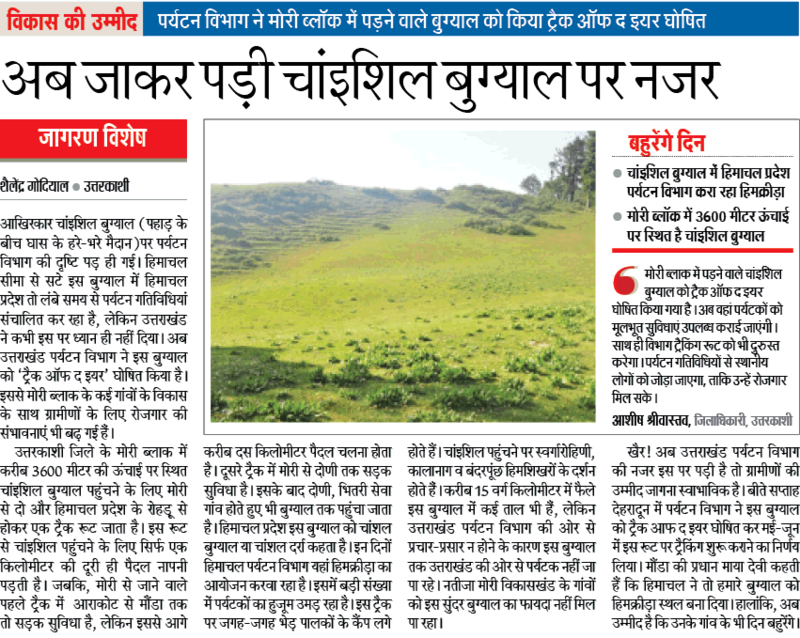 Tikula Thaatch: This is one of the largest enormous bugyal (alpine grasslands) in Uttarakhand stretching from Himachal Pradesh all the way to Uttarakhand. It could easily be converted to a spectacular world class golf course or a ski resort. Taaramandal: It is another mesmerizing destination in Chaaisheel valley. It is a speculate hydrosphere where the water flows with high velocity like a fountain. It could easily be a popular tourist hangout for adventure lovers. Bhiusingh Dhol: It is an enormous cliff is situated amidst the apple orchids and makes up for a spectacular landscape. It is believed that this cliff was erected by Bheema from Mahabharata. It could also be made into a bungee jumping destination. Other mesmerizing bugyals in Chaaisheel valley include Falchi Thaatch, Sapaaha Thaatch, Dhupalattu, Kuba Thaatch, Sai Sunai Thaatch, Koshmolti Thaatch and Budik Thaatch. Few more tourist destination in Chaaisheel bugyal includes Baalcha, Kotujaani, Butaha Tahppad and Lambhi Dhaar. Chaainsheel Buygal is also known as Changsheel Trek, Chainsheel meadows, Chainsheel trek, Chainsheli as well. What is Chaainsheel Bugyal famous for? Chaainsheel Bugyal is famous among tourist as Trekking, Meadows, Camping, Scenic Beauty. Chaainsheel Bugyal is recommended destination for Couples, Groups, Solo. Chaainsheel Bugyal is popular destination for following activities/ interests - Camping, Meadows, OffBeat, Trekking. Travelling to Chaainsheel Bugyal in 2019? Contact us for planning your Chaainsheel Bugyal tour with best travel packages of as per your requirements!